You know those moments when you just feel silly and you're glad no one knew about your mistake? We'll I'm gonna share mine with you. 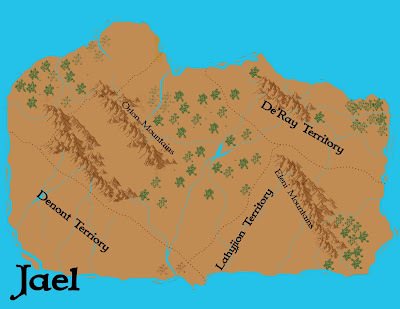 So, I go in to work on my map in Photoshop. I chose a brush only, no matter what I do, nothing shows up- no color, no mountains, nothing. It's not working. I reset my brushed. That didn't work. Since, I'm not a Photoshop professional, I start pressing random button. That didn't work. I Googled it. Came up with a bunch of forms and blogs. None of them helped. Then, on one form, it said make sure the brush color is something visible. So, I changed the brush color and that worked. Seriously. All that and I just needed to change the color. That's ridiculous. 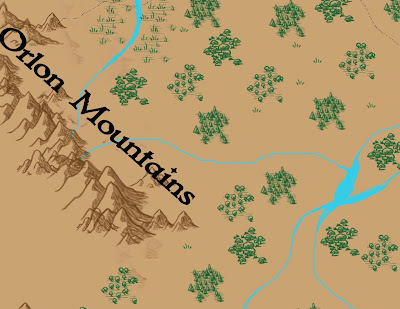 Anyway, on the last post, Fantasy Maps: Mountains and Rivers, I created this with the help of the some tutorials. Now, my map looks like this. I have no idea how I changed the color. I clicked something and it changed. I liked this better, so I kept it that way. When you're first starting out with Photoshop, much of what you do will be the result of a happy accident. Because I thought it was cool, here's a close up. I used this tutorial to kelp me. I love this series so much. I didn't include cities because the only brushes I found were of castles. My world isn't set in medieval times. It's like an alternative version of ours. There are no castles in Jael. I'm not putting in any images to represent cities. Instead, I included in the name- like most atlas do. 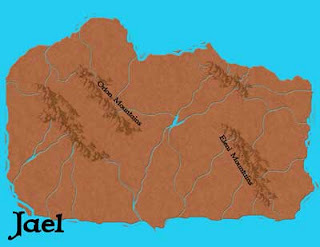 Jael is divided into territories, cities then wards.